The New Brunswick Innova 44R incubator shaker is microprocessor controlled, with several operation modes to choose from. Users can set the incubator on continuous use, on a timed cycle at a set temperature and speed, or programed to vary speed and temperature during a run. The temperature range of the Innova 44R Incubator Shaker runs from 20°C below ambient to 80°C, and with two units stacked, the speeds range from 25 to 300 RPM. Lastly, the Innova 44 Incubator Shaker can be controlled remotely through a RS232 interface, allowing users to monitor and log data from outside the lab. The New Brunswick Innova 44R incubator shaker includies an imbalance sensor that will automatically shut the motor down, and if the door is opened mid run, a drive interrupt cuts the power. To protect samples, visual and audible alarms will sound should speed or temperature deviate from the set point, and when time has elapsed. The New Brunswick Innova 44R incubator shaker can be double stacked for a space saving, efficient solution for your lab. This large capacity orbital shaker uses a triple eccentric counter-balance drive mechanism set on 9 permanently lubricated ball bearings. Orbiting at either 1 or 2 inch diameters, in a horizontal axis rotary motion, the solid state brushless motor utilizes acceleration and deceleration control to prevent splashing. 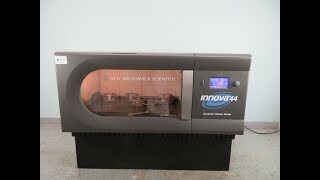 This New Brunswick Innova 44R Incubator Shaker has been tested and works beautifully. Please note there are two blemishes, pictured, they are cosmetic and do not impact performance. All of our lab equipment comes backed with our standard warranty. If you have any question, please don't hesitate to contact us.